Criteo Labs > Miscellaneous > Aujourd’hui, je code! 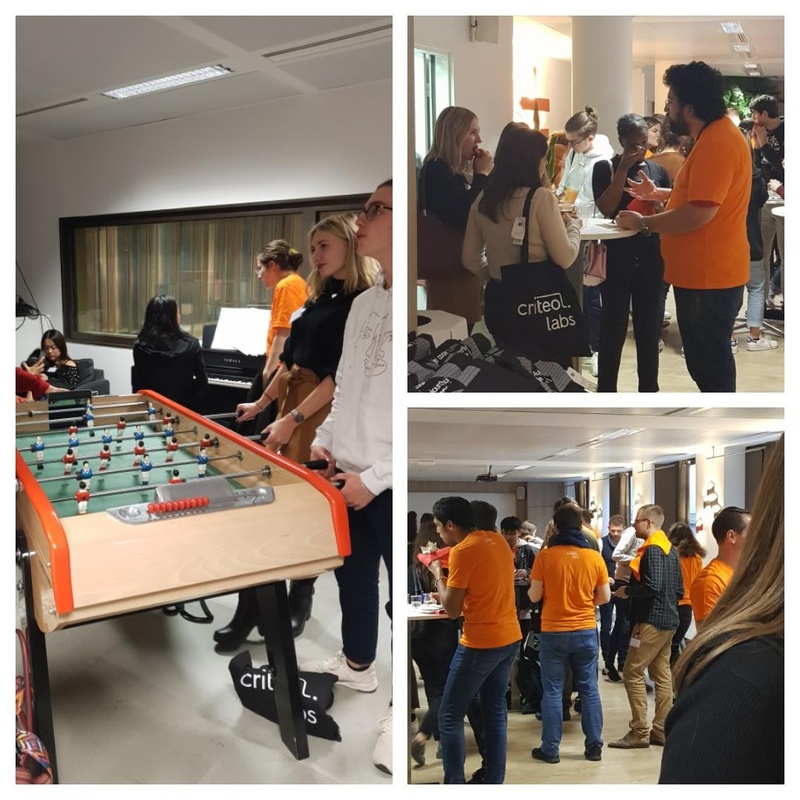 The 3rd edition of Aujourd’hui Je code, organized by Criteo’s Women in Engineering group in partnership with Foundation “CGenial“, was held on 30 November 2018! Students from three different high schools joined our engineers to discover software engineering, Criteo, and why diversity actually matters in tech companies. At Criteo, we have a lot of software developers and we thoroughly enjoy the creativity that computer programming unlocks. Programming is a lifelong learning experience, which is enjoyable whether you start earlier or later. But starting earlier is clearly the best! Women In Engineering group organized the first edition of this event in November 2017. In June, we decided to open the event to a certain amount of boys, reversing the tech percentage of men and women (today: 84% – 16%); and we decided to keep this as we had some great feedback from students, boys and girls with the experience. Our group of engineers, always willing to adapt and improve, has decided to work some new coding exercises, adding Robot Rock and Othello. With two sessions of one hour and a half each, students were given a chance to discover different aspects of computer science and programming. Most of them had only very basic, if any, experience with coding. We wanted to give them a real feel of the coding experience, and most online programming platforms were too constrained for that. Scratch is great, but targeted at younger kids. The day started with a nice breakfast and distribution of goodies. In the meantime, engineers would present the different exercises available, so that students could enroll for the morning activity they like the most. Muleine gave a presentation of Criteo, and a high-level overview of the R&D. Then students would split into their first workshops sessions. Before starting their second coding workshop, engineers gathered all the students on the amazing Criteo rooftop to take the group photos and selfies with the Eiffel Tower and Sacré-Coeur. After the last workshop session, we all join for a nice break filled with informal talk. Organizing such an event requires a lot of upstream work. A large part of the effort was put on preparing programming and infrastructure lessons tailored for our visitors; one needs to strike a good balance between workshop attractivity and amount of technical background required to complete it. One hour and a half is really short after all! With the close help of the Criteo volunteers, the teens discovered new uses for what they have learned in math or physics classes. Like how to use simple multiplications to create new colors or how to reproduce the feel of gravity laws to make a ball move in a game. They learned game programming tricks, how to adapt the code to animate objects, handle the mouse, connect widgets. They learned how colors work for digital images and how they can play with pixels. They could colorize the output of the webcam with fancy flag colors, and were shown how to use face recognition to add cat ears on their face! They learned how to extract statistics from TV Shows feeds. They also learned how to write music as code. They had an introduction on PC architecture by physically re-building a server we tore apart. They were initiated to the world of dynamic routing in computer networking via a role-playing game where each participant incarnates a router. It allowed them to grasp applications in the real world of mathematical concepts like the theory of oriented graphs (Dijikstra). Most importantly, they learned that programming was much more than just sitting behind a computer and writing line after line of code. As a lot of Criteo teachers were women, they could easily relate. Also, it was obvious we are passionate and happy programmers. Students and Teachers were grateful and really enjoyed this day, we will keep reiterating this event and always try to improve it! “First feedback I have is that students really loved it. They took great pleasure doing the workshops, even though most of them are not used to code. One of the girls even told me she was now willing to do a DUT in computer science. Thanks to the Criteo Women in Engineering group for the valuable feedback and improvements on this initiative!